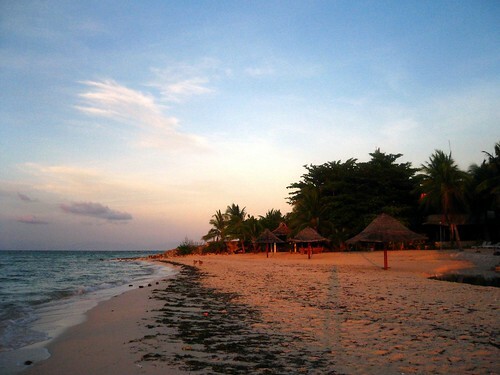 Because of Anton, I decided that we should book ourselves in Kota Beach Resort for our stay in Bantayan Island. Anton's pictures of the resort were breathtaking, and I couldn't wait to get to see it for myself. We were picked up by Manong (we forgot to ask for his name, sadly, for our entire stay there) from the resort when we docked at Sta. Fe. It was a 10-minute ride (or less pa ata) from the pier to the resort, in a small open-air vehicle like a jeepney, but a much smaller version. It was a short ride that showed the easy-going way of life of the people in Bantayan Island -- pedicabs and trysikads were, I think, the mode of transportation for most Bantayanos. The huts in the resort are single-detached wooden cottages with beds, a small cabinet and dresser, with two chairs, a small yet clean bathroom and a spacious patio. The huts are also a good distance from one another so you can be sure you won't be bothered by other guests. For a picture, go here, c/o Anton, but it's pretty dark though. The setup of the room is very simple, but really, do you need an extravagant room when you'll be spending all your time on the beach? 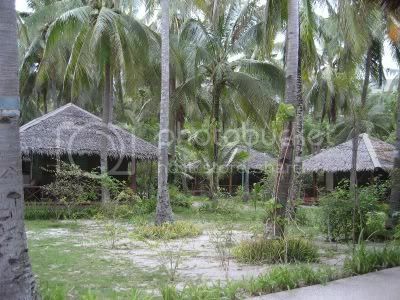 :) And also, the cottages are surrounded by lots of greenery like coconut trees so the place feels like a truly tropical paradise. 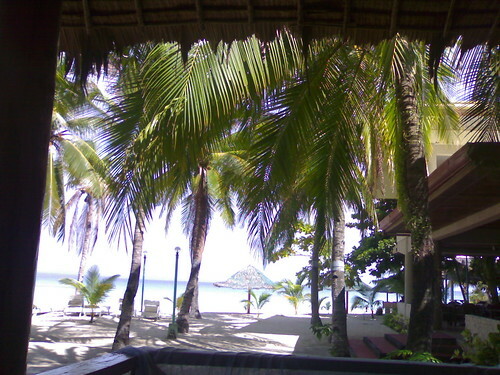 We were very fortunate to get the cottage near the beach and the resort's restaurant! :) The food is lutong bahay -- I especially loved the danggit breakfast, calamares and their fried chicken. Of course the food takes time to reach our table because they'll cook the food only once we order it. Yayie loves the timpla of their Lipton iced tea, while I enjoyed my mango shake :) Their staff is super bait pa and very accomodating! Manong (the one who picked us up at the pier) was the one who arranged our snorkeling trip [watch out for part three ;)]. 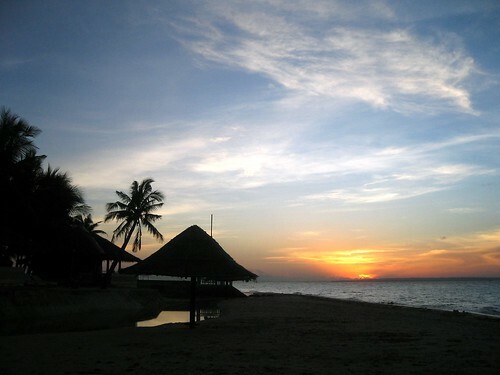 One of the reasons why I wanted to go to Kota Beach was because of the sandbar. 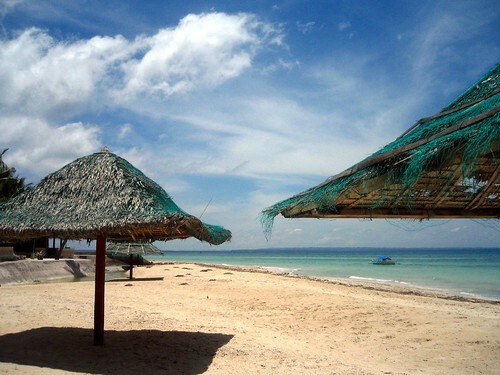 A friend of mine who also went to Bantayan Island already showed me pics of the sandbar. Gawd, diba ang ganda!!! On our first morning on the island, I was the first one to wake up. I slept early the night before because of a stinking headache. Anyhoo, I enjoyed some loner time and took some sunrise pictures. I went into the water for a while, but the damn dried seaweeds floating around near the shore was making me paranoid. Also, I was the ONLY person around that time, so if ever something happens to me, I wouldn't be able to call for help, yikes. That's when I laid back on a chair, had a few smokes and tried to catch some Z's while my skin burned a lovely brown. But after lunch, as the water and shore line cleared, the disappointment over not seeing the sandbar quickly faded. This beach is the most beautiful and stunning beach I've ever been to! The water was not that deep, too, because we were already a few meters away from the shore and the water was only waist deep! Ang saya! I am definitely going back to this place next summer, by hook or by crook! We got a triple-occupancy cottage for 1200 per night, and an additional 150 per night for the extra bed. Credit card is accepted, with additional 10% charge. They gave me their published rates, email me at missyosigirl at gmail dot com if you want the price list. so, nag advertise ng resort. hehe. but of course! ang bait nila samin eh! hay naku talagang babalik ako next year!!! This is indeed very nice!! One of my favorites too :) Wow, you have a detailed posts on this. Let me know once you complete the series. I'll link you up in the post. Thanks! BTW, the photos are nice. if you make them a little bigger it would be more stunning. The small photo, does not do justice to the beauty of your shot. i'll try to make the pics bigger :) i hope it will still fit within my layout though. 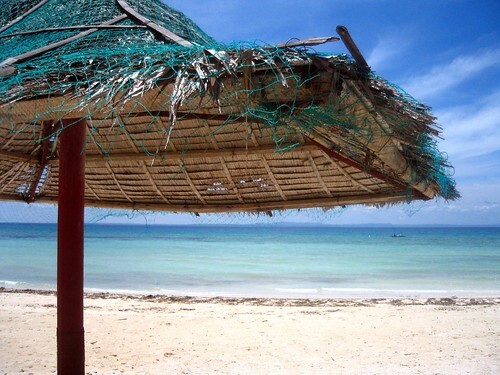 we're going to bantayan this week and this post really is a big help. 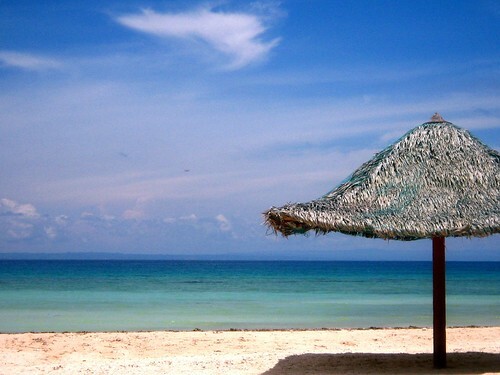 it'll be my first time to go to cebu. 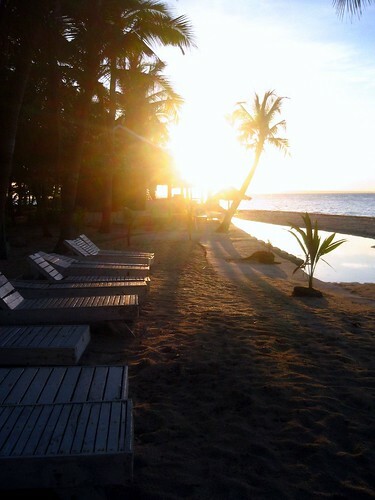 we'll be staying in kota beach also, hehe ksi nabasa ko rin sa blog ni anton.